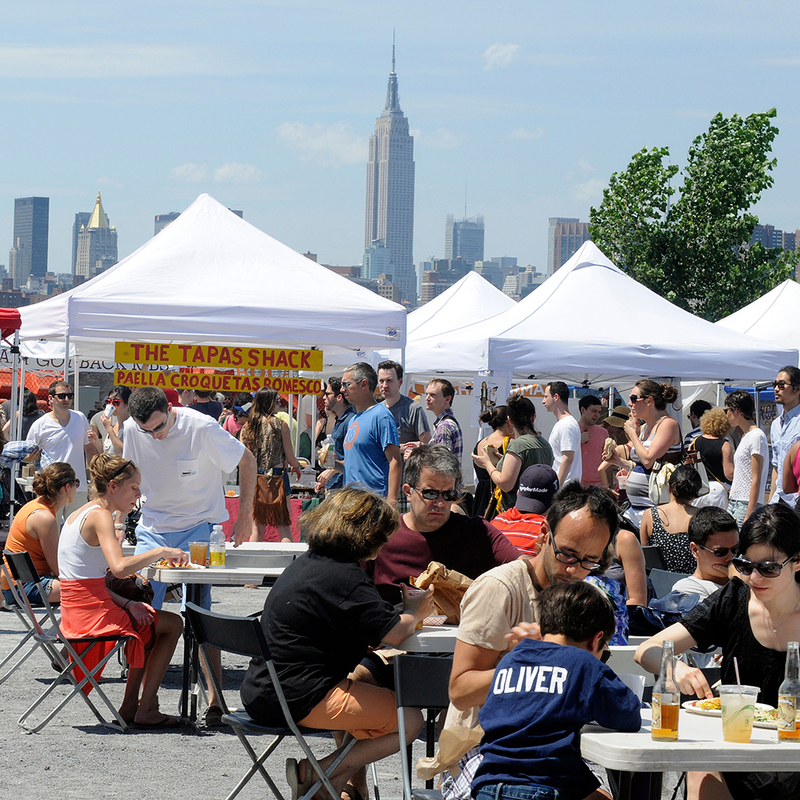 Will Brooklyn's Smorgasburg Work in Los Angeles? Los Angeles is abuzz with news that Brooklyn's famous Smorgasburg will soon take up residence in the City of Angels. At least, it would be abuzz if anyone had heard of it. Brand recognition is just one of the issues that may face the popular food and crafts market as it makes a permanent home (every Sunday) in downtown L.A.'s burgeoning Arts District beginning June 19th. Frankly, it still seems a bit weird that an event bearing the name of the neighborhood it was created for (and has moved twice within Brooklyn, abandoning its namesake locale) would have any clout in L.A., whose food community already has a strong presence, not to mention a notable chip on their shoulder when it comes to anything claiming to be cool, especially from New York City. But the 5-year-old Brooklyn foodstravaganza, an offshoot of Brooklyn Flea, has previously branched out in Philadelphia and Washington, DC with varying results. Can a Los Angeles location keep up a winning streak? Ben Waters of LAFoodie.com, a local online community that has hosted food festivals of their own, says the prospect of a weekly Los Angeles-based Smorgasburg is exciting, but isn't necessarily a slam dunk. One issue is that much of the community may not know about Smorgasburg to begin with. "I've heard of Smorgasburg from New York friends, but most people I talk to aren't aware of it," Waters told FWx. "As a foodie I'm looking forward to it. But I'd be interested to see how many vendors they can actually sustain every Sunday over an extended period of time." Another problem is that L.A. is so geographically vast. Getting a food lover from Manhattan to Brooklyn is just a matter of a ride on the MTA. But a drive 20 miles from Manhattan Beach to congested DTLA may as well be transcontinental. The same goes for the vendors who have to trek into the space and, on top of that expense, turn a profit. Waters said from his experience putting on pop-up festivals that "vendors we work with are operating on small margins. If you're not getting enough business, you don't show up that day. It's not worth your time." There's also the more laid-back L.A. attitude to consider. As a former Angeleno myself, I can attest that if I know an event across town will happen again next week, it's so much easier to put off going this week (to infinity). Waters agrees, saying one-off events tend to do well in the area. "The limited time aspect is a motivator that will activate more distant consumers to make the trip. Can they keep enough locals coming back and drawing enough people from outside the area once the 'new' luster is gone?" Still, if the area is built up with surrounding attractions as developers intend, a west coast Smorgasburg could become just as much of a destination as it is in Brooklyn. Downtown L.A. is already home to a few notable eating and drinking hangouts, including Angel City Brewery and Grand Central Market, a food hall that’s home to cultish spots like Eggslut and McConnell’s Fine Ice Cream. Since Grand Central already has a permanent footprint in the area Smorgasburg will necessarily have to steal some of its gastronmical thunder if it wants to survive. Adding to the challenges, Smorgasburg's home base at the Alameda Produce Market is quite a few blocks from nearby subway stations and while that's no big deal for a New Yorker, L.A. residents are still getting used to this whole train/walking thing. The key might be to sell Angelenos that this version is specifically by and for them. "I don't think the 'this is a cool thing from New York' pitch will work here. New York has it's own cultural cache which we respect, but L.A.'s attitude is definitely 'we have our own thing going on,'" Waters said. But the hybrid of New York and Los Angeles vendors, as well as occupying the biggest Smorgasburg space in existence is certainly attractive. "If they sell it on its merits, they'll have a line out the door."